But the rewards don’t stop there. 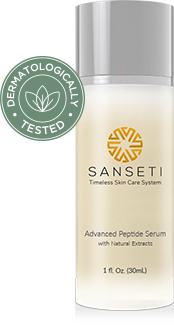 Get our Advanced Serum and help us share Sanseti across the world. As a thank you for your order we’re giving you one last chance to lock in savings on Sanseti’s line of products. If you go to our store right now, you’ll find our Advaned Peptide Serum available for $49.95 (which is a great deal for the quality of our formula, and clinically proven results). Claim our Advanced Peptide Serum for just $29.95! A clinical test with Palmitoyl Pentapeptide-4, a main ingredient, resulted in a 44% reduction of deep wrinkles, a 37% reduction of main wrinkle density, and a 16% increase in lifting effect. 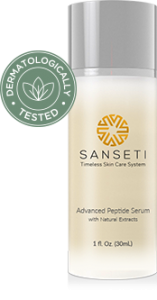 As a thank you for your order we’re giving you one last chance to lock in savings on Sanseti’s line of products. If you go to our store right now, you’ll find our Advanced Peptide Serum available for $49.95 (which is a great deal for the quality of our formula, and clinically proven results).